"You can't give from an empty vessel"
A great mantra I learned earlier this year and repeat to myself often, but it is easier said than done. Especially when you have a job that never really has a clear "clocking out" time. By a series of good fortune, though, Andrew and I happened upon a blissful and coffee-filled 24 hours to celebrate our two year anniversary. Converging was an invitation to stay at the Joule and having just traded engagement photos from some very nice bottles of champagne. So bring on the Dom and fluffy robes, we enjoyed ourselves an ultimate staycation. And we brought Truman along - WHAT more could a girl ask for. How did we spend our time? Mostly food. We were going to try to go to the spa but of course tried to get so much done the Saturday before checking in, it would have been a bit much to squeeze in. So we're saving that for a day (hopefully) in the near future because I've heard wonderful things about the Joule Spa. 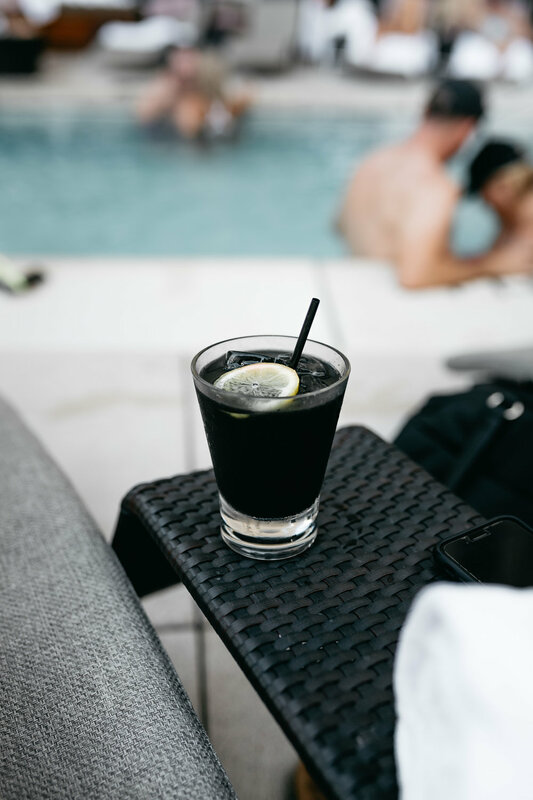 The Joule pool is a guest-only amenity which is refreshing in many ways since what Dallasite isn't trying to hang out at a nice hotel pool in these dog days of summer. Here's a thing you may or may not know: I'm obsessed with my dog Truman Capote. After the pool we headed back to the room to hang out with T, sip some champagne, and get ready for dinner. The rooms are so luxurious down to every detail. And the robes are heaven. Put plates of fried risotto balls, whole branzino, stuffed zucchini blossoms, apple tart, and tiramisu, and multiple glasses of wine in front of us and we are up for the challenge. Haven't come across any dish I haven't loved at Americano (which also happens to be on my list of most inspiring spaces in Dallas). Everything was delicious, everything felt decadent and 'vacation-worthy' but a huge part for us was getting to snuggle with our puppy and spend more time together. Look closely. This is the point of the ENTIRE POST. We buy it, I look up at him and smile, I feel warm and fuzzy inside. I'm so excited to own this bit of culture. We get in the elevator. We are too adorbs I guess, and as Andrew kisses my cheek... COFFEE. Coffee on my shoes, on the floor, and on every single page of the book. He felt so bad but I honestly didn't respond very well, which is unusual for us. I think sometimes there is pressure for an occasion to just go *so* perfectly, I tend to analyze every little interaction comparing it to the ideal image I see. It was a good lesson for me, because I hadn't realized I had been doing it until our ride home and we were both a little frustrated and I had some time to think about how I handled it. A week later, a package arrived for me. A brand spanking new pristine copy of the book, sent from my loving, thoughtful husband, "so I could tear out and hang the pages of the coffee-stained one and keep the other one as a beautiful coffee table book".... I married an amazing man. And remind myself to always take a breath, be patient, and work as a team through anything.